To create this page, I used sketch #128 from my collection of 500 Scrapbooking Sketches. Please note that I have made this page to feature photos from a young girl’s birthday celebrations, but the colours could be easily changed to suit anyone. Materials Used: Scrapbooking papers by Provo Craft, white cardstock, alphabet stickers from Doodlebug, Diecuts With A View and Mrs Grossmans and Sandylion Birthday Icons Borders stickers. This birthday layout is very easy to create. Begin by making your backdrop. To do this, you will need two pieces of co-ordinating paper. Use one as the base for your page. Cut the other at an angle, like that shown above, and glue to the bottom of your page. Use the yellow and orange border sticker to cover the join between your two papers. This gives your page some character and is far more interesting than a straight edge. Please keep in mind though, that because it is at an angle, it will not stretch the whole way across your page. As a result, you need to cut it in a place that will be eventually covered by one of your photos. This will enable you to leave a gap between the two pieces (behind one of your photos) so that it looks like it goes all the way across. Now that you have your background, it’s on to the photo mats. These are very easy to make too. First, mat two vertical 4×6 photos with white cardstock. Mat again with pink paper, but this time, leave a gap at the bottom of the photo mat. This is so you can stick your streamer border sticker across the bottom of each photo mat to give a festive look to your page. How you create your title is up to you. I used a selection of letter stickers of different sizes, fonts and colours. If they were white, I also matted them with pink paper so they wouldn’t get lost against the background. I also added two small birthday stickers to add interest to my title. Finally, I arranged a small selection of birthday stickers in the bottom right corner of my page to add interest and give balance to my design. If you wish, you could also add some journaling here. Oh, and for one last touch, I added a birthday balloon sticker between my two photos. And then it was done. In very little time, I had a fun and festive birthday scrapbooking page. And all it took was some fun papers, a scrapbooking sketch for guidance and some cute birthday stickers. I’d love to hear what you think of my Birthday Scrapbooking Idea. Please leave a comment in the comments box below. 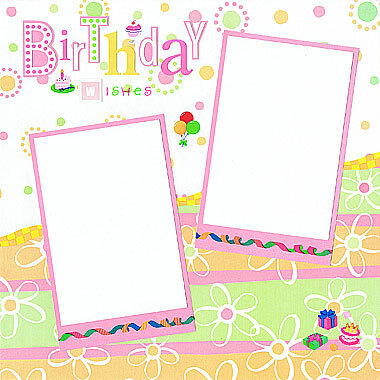 This entry was posted on Wednesday, March 5th, 2014 at 10:43 am	and is filed under Birthday, Scrapbooking Stickers. You can follow any responses to this entry through the RSS 2.0 feed. You can leave a response, or trackback from your own site. As with any endeavor, you will have to do quite a bit of marketing. into the same architecture that you will encounter violent scenarios. It would be great to choose such platform that suits to your skills and requirements of clients. 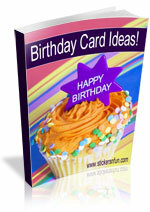 Hello,Thank you very much for sharing us about the birthday card. My little brother birthday comes on 30 June. I have ordered the printing company and they tell me i filled automatically all greeting cards. My brother birthday held on 11 June and i buy 10 this type of wishes cards. We can use these wishes cards as a gift and can write the best prayer too.